Step 1 – What does your Pass or ticket look like? ALL old Okemo season passes and Real.Easy cards will no longer work and need to be switched out for a new pass card. If you already have your new pass, go to Step 2. Want it sooner? Stop by a Resort Services desk at Okemo any day between 9 a.m. and 4 p.m.
Stop a Resort Services desk at Okemo any day between 9 a.m. and 4 p.m. When you arrive for your first day make a quick stop at the Pass Validation Station (the tent just outside of the Clock Tower Lodge) to get your pass scanned and checked before heading to the lifts. If you need further assistance, feel free to call 802-228-1600. Labor Day has come and gone and that is the unofficial start of fall. The weather doesn’t really say that as we have had some warm days but it won’t be long when we have some crisp nights. This summer here at Okemo was a good one. Okemo Valley and Tater Hill golf courses had a strong summer. The Adventure Zone and EVO Bike Park had many visitors too. 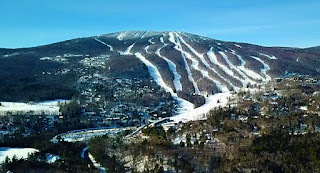 Vermont is very popular in the summer and Okemo is working hard to continue to offer plenty to do around the resort. 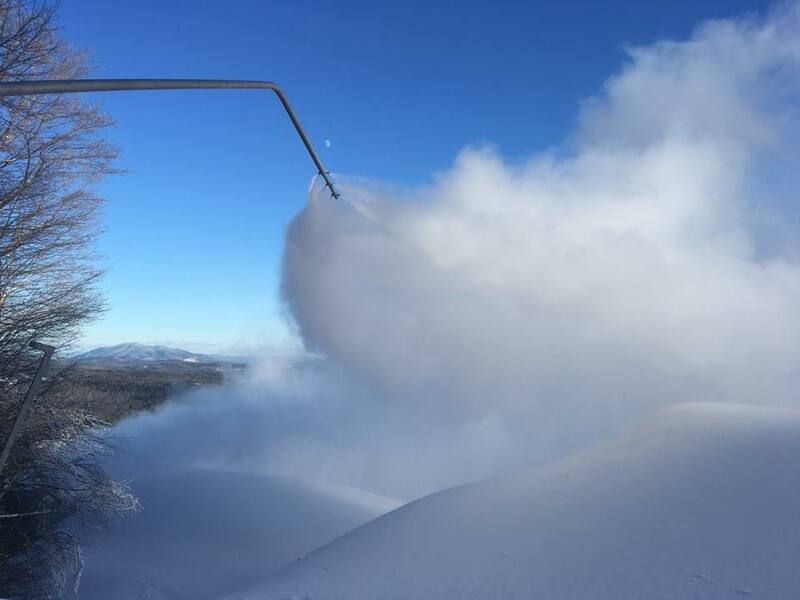 Improvements for the winter have been taking place, and this has included new snow guns as well as upgrades in snowmaking pipe on Lower Arrow and Black Out. The replacement of this pipe is somewhat hidden but the impacts are significant. The snowmaking pipe replacement will make for more reliable water into the mid-mountain pump station and thus more snowmaking capacity from that pump station and on the upper sections of the mountain. There will also be a replacement of the chairlift cable on the Morning Star Triple, as well as repainting done on the Black Ridge and other lifts. Carpet, roofing and painting has been done in many of the public spaces of the lodges. In the Summit Lodge Sky Bar, there will be a new bar to greet skiers and riders. The new wooden bar looks great and it will be a nice new touch to a great location to stop and get a drink during your ski day. There continues to be work on WIFI points to enhance connectivity around the and work is being done on improving recycling options and other lodge improvements. The question about the Vail Resorts transaction is what’s primarily on everyone’s mind. We continue to look at a potential mid-September closing date. The staff of Okemo, as well as Vail Resorts, is eager to finish this process and begin working as one company. We are excited about this transaction happening and understand there will continue to be questions on seasons passes, ticketing and other items. Once the closing is complete, these questions will be answered. Tim and Diane will be retiring and enjoying some quiet time, but most likely staying busy with their grandchildren and hobbies. If you would like to send a note to the Muellers, feel free to send them an email at info@okemo.com. All emails sent will be forwarded to them directly. The mailing address for Tim and Diane is Okemo Mountain Resort, 77 Okemo Ridge Road, Ludlow VT 05149. The Okemo Job fair is scheduled for Saturday October 20, from 10 am to 3 pm, in the Clocktower base lodge. Snowmaking will begin any time after November 1st and we anticipate opening as soon as possible in November. Thanks for your support in the past and I am hopeful of your continued support moving forward. The Okemo Difference will be continuing and is alive and well! As most who are reading this all know, the month of June brought with it some exciting news for Okemo, Triple Peaks and the Mueller family. I am so happy for Tim, Diane, Ethan and Erica, that they can go out on top and that the sale of Triple Peaks will allow Tim and Diane to retire and enjoy some quality time away from running the ski area. I am also excited about the new ownership of Triple Peaks – Vail Resorts. I was working for Okemo when Tim and Diane became the owners of the ski area. There was a lot of apprehension, unknowns and anxiety amongst the staff, the community, and skiers and riders of the resort. Much of this anxiety and uncertainty was quieted down because Tim and Diane and the leadership team were up front and communicated with the town and employees about what their vision was. Fast forward from 1982 to 2018 and we have a similar situation. No doubt the stakes are higher, the resort is larger and there are more employees, but the venue, Ludlow Mountain, is the same. Okemo is going to be purchased by a strong player in the ski industry and one which has a proven track record of working to provide the best possible ski and ride experience and to thoughtfully engage and contribute to the surrounding communities in which it operates. Vail Resorts’ mission says it all: Experience of a lifetime… This goes for guests of the resort as well as employees. Let’s address the elephant in the room. There will be changes. And I am hopeful that our loyal guests and supporters will trust that these changes will have this in mind: providing the experience of a lifetime! 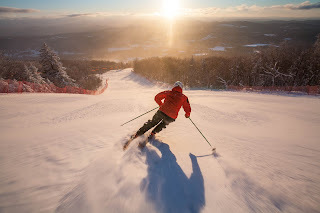 I understand that not all changes will be embraced positively, but if all of us – staff, loyal Okemo supporters and townspeople – allow some of these changes to play out, I truly feel that you will be positively impressed with what these changes do for the resort experience and for our community. Right now there are questions on the season passes and some of these questions most likely won’t be answered until after the closing. Vail understands the need to work through the challenges and all of us at Okemo are working to answer and solve some of these more complex topics. Vail is also committing several million dollars to Okemo and the other resorts for capital improvements. More information will come on this later, and it is exciting to think of the possibilities. Moving along, I will work to do my best to keep loyal guests, supporters and staff, up to date on how things are progressing and what is happening. 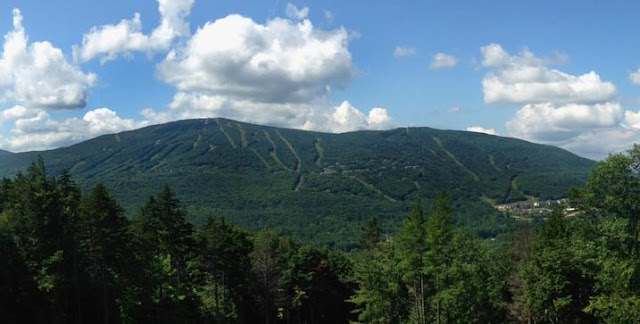 Okemo is open for the summer season, two golf courses are open, The Adventure Zone is open and, of course, Coleman Brook Tavern and Willie Dunn’s Grill are open for lunch and dinner and Coleman Brook Tavern for breakfast and weekend brunch. So I hope you’ll be patient and optimistic. Let’s embrace the change and congratulate Tim and Diane for a great run and wish them nothing but the best in retirement. 2017-2018: 163 Days of Skiing and Riding! As Okemo passes Day 150 of the season(4/09), we continue to have winter-like weather; it isn’t very often that morning temperatures in April are in the mid-teens! The long range weather forecast looks great for some spring skiing and with riding, with more spring-like temperatures in VT heading into the weekend. We've been asked about how we make decisions concerning our closing date, as well as how and when we decide to consolidate operations. I can tell you that these decision are made with forethought. We look at many factors, including the long range weather forecast, snow conditions, and yearly history, as well as lodging occupancy and advanced online ticket sales. Our decision to consolidate our ski operations down to one base area was done to concentrate on a smaller footprint, while still providing an enjoyable guest experience. Business levels do come into play, but we also try to not be wasteful, which can happen with running lifts, grooming trails, and opening up cafeterias and restaurants that will see very limited use as we head into mid-April. There have been several guests who have voiced their displeasure and while we won’t be able to please everyone, I can assure you that we think through these changes in operation diligently and look to find a compromise. It's still our goal to provide some great skiing and riding for our loyal season passholders, as well as those who may only come and visit us a few times a season. Extending our closing date was something that was embraced by ownership as well as our management staff. Having such great conditions on the mountain, we all felt that this was the right decision. Extending the season required some managers to adjust their schedules and cancel or move their vacation time, but we knew it was what our guests would expect from Okemo. All Okemo employees were willing to do what was necessary to keep skiing & riding until April 22nd. Thanks for your support this past season ... I can’t thank you enough for skiing and riding with us. A 163 day season is a good one. There were no doubt some weather challenges in December & January. In February it felt like the season would end early, but March roared in and was one of the better months on record. Okemo prides itself on being a family for both our employees, as well as for all those guests who spend their time with us. We are truly humbled by and appreciative of the days you spend with us and for the confidence you have in our skiing operation, our lodging and all the other departments that make up this great resort. Skiing will continue for a while longer and while not all the trails, lifts, lodges or buses will be open or operating, we will continue to run some lifts, groom lots of trail and keep restrooms open in the Summit Lodge. Golf will be opening in late April and the Adventure Zone on Memorial Day. Mountain Biking will soon follow! Five feet of snow in March! We are at the midway point of the month of March and have received, on average, around 140” of snow to date and about 60” for the month of March … it doesn’t get any better than this! After the third nor’easter, some might say “uncle,” but I would say call your “uncle, and get him up here for some skiing and riding! We anticipate maintaining our full trail count for a while, looking at the long range weather. The lift count will fluctuate in the 9-12 range midweek, and 20 for the weekends, with potential adjustments being done later in the month. Snowmaking by machine has ended for the season. The snowmakers and groomers did a great job getting us up and going and taking care of the many weather events we have had. Mother Nature took over for March and they didn’t need to fire up the guns. As many of you heard, Okemo announced a partnership with Vail Resorts to begin a long-term alliance beginning next winter, to be part of the Epic Pass. Pass holders who purchase Epic, Epic Local and Epic Australia will receive seven days of skiing and snowboarding with no blackout dates at each of our three resorts: Okemo, Mount Sunapee and Crested Butte. Epic 7-Day pass holders can use any, or all seven, of their total days, and Epic 4-Day pass holders can use any, or all four, of their total days of skiing and snowboarding with no blackout dates at the three resorts. Guest can then purchase tickets at a 50% off rate for the duration of the season. Okemo Gold, Ultimate & Classic pass holders will be able to purchase 50% off single day tickets at the Vail Resort Ski Areas. We are excited about this alliance and look forward to having Epic Pass skiers and riders experiencing Okemo. Okemo is hosting its annual Sugar Daze concert on St Patrick’s Day this coming Saturday, March 17. The featured band is Blues Traveler. This event should be fun with nice weather forecasted, although a coat may be needed. Music begins at 3:30 with Braiden Sunshine & Jake Kulak; at 5pm Pete Kilpatrick Band; and at 7pm Blues Traveler to finish out the evening. Okemo is committed to staying as close to full operations as we can as we head towards the end of March and Easter weekend. There will, no doubt, be some adjustments of services, but our goal is to make the least of an impact to our guests as is possible. There will be operations changes because of weather and we will do our best to let you know of these before you begin your ski day. Once Easter rolls around, we will be looking at more significant adjustments to operations and services – at least midweek. I get asked daily what our closing day will be, and at this point our plan is to close on Sunday April 15* As always the * (asterisk) means weather-dependent. The presidential holiday is here and Okemo is ready to work hard to provide the best possible experience we can. This coming weekend's weather is looking good. Friday’s weather has been overcast and cloudy, but we are expecting that Saturday, Sunday & Monday will be sunny with temperatures in the mid-20s on Saturday and mid-30s or higher on Sunday & Monday. The temperature will be dropping Friday evening and snowmaking will be starting up and running on as many mainline trails as possible. These will include Upper World Cup, Lower World Cup, Count Down, the Summit Area, Sapphire, Upper Arrow, Lower Arrow and the Base Area. Grooming will be done across the mountain on open terrain. It is expected that many of the gladded trails will end up being closed until the snow softens up. Okemo staff will be working hard to provide an enjoyable resort experience. We will be at full operation in all our departments. This includes all our culinary outlets, all lifts & carpets, as well as our Nordic operation, Ice House, Spring House, Snow Tubing & Mountain Coaster. There will, no doubt, be some times when there are less than enjoyable lines to access our lifts and other services. Rest assured that our staff will be doing all we can to make those lines move as fast as possible. As we all know, it does take time to get guests checked in, load lifts and answer phone calls. Our staff is committed and will try to do whatever they can to speed up these necessary interactions. There have been questions about snowmaking through February. Okemo is committed to building base depth, as well as working to provide the best possible skiing and riding through the ski season. We will continue to make snow as needed and when it is possible. We will make “game time” decisions on snowmaking as we head into the end of February and early March. There needs to be a “need” on the trails, a good window of temperatures and a forecast that assures us that the snow will stay around. You can be assured that we are constantly monitoring the conditions and long range forecasts so that we can stay on top of things. The Okemo Team is ready and committed to a great week and we are hopeful that you will see the “Okemo Difference” while at the resort. If you have questions or comments, feel free to reach out and let us know how we are doing. The Christmas week is upon us with New Years almost here. All of us here at Okemo want to thank everyone who has been spending time with us out on the slopes and around the resort. We are experiencing a real winter. This is like the ones your grandmother told you about when she had to walk to the one room school house up hill -- and who ever got there first had to start the pot-belly stove to warm up the room! This is great for skiing and riding and if you dress for the conditions it can be truly enjoyable. It is important to communicate with our loyal guests and let you all know what we are thinking for the future here at Okemo as well as why we do some things. I’ve had many people ask me about the weather event we had last week. The weather was a mixture of freezing rain, snow and then rain in the base. 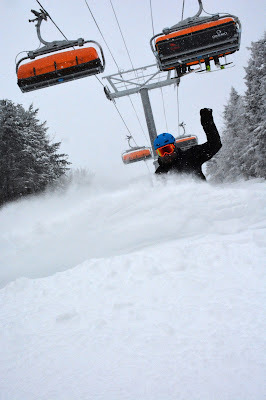 The Okemo staff worked hard to keep the lifts running but we just weren’t successful to keep them going all day. We take the closing of a lift very seriously but safety for our guests and our staff is our first priority. When a lift is closed we put the information up on the reader boards at the lifts and in the lodges, we also have a Mountain Update link on our web site and we post to our Twitter page. A lot happens quickly during weather events but we work hard to communicate what we know. There are times when the Jackson Gore lifts have issues and we have to run shuttle buses from Jackson Gore. This is never an enjoyable event for anyone. I can assure you we will be reviewing our communication. I heard from several guests that they were unaware that the Quantum Four was not running after they had ridden the Coleman Brook Express. Not a good situation and one we can improve on. Why are we making snow around the Black Ridge triple and Base Quad A after we have gotten over 2 feet? Okemo will remain aggressive in our snowmaking. We will continue to make snow when it is cold to keep the water flowing. Our plan is to make snow tonight so we need to keep the water flowing and some snowguns running. It is very hard, and at risk of freeze-ups, when the system is charged in temperatures like this so we continue to make snow during the day. Making on Black Out is our objective to help create the terrain park as well as build moguls for competitions and guest enjoyment. I apologize for those who were inconvenienced while riding the lifts. The snowmakers work hard to constantly adjust the snow guns, but at times we just can’t get it right. Our snowmaking plan is to make snow in the Superpipe, finish Hot Dog Hill & Black Out and then when we get out of this polar vortex, head towards the South Face area and make on Wild Thing, Punch Line & Dreamweaver. We will also be making on Big Bang & Triple Sec to finish things up. Some trails will be resurfaced to keep the snow texture top notch during the next week to 10 days. The entire Okemo has worked hard in this cold weather. From Lift operators, Culinary staff, parking attendants, Mountain operations staff, Hotel and Resort Services staff. They all have contributed to make your experience here at Okemo and enjoyable vacation. While we can’t control the weather, we can control the helpful and friendliness we provide. 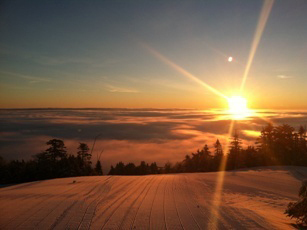 Thank you for your support of Okemo and on behalf of the entire Okemo team, we want to wish you a very Happy New Year!